Autumn is officially here sadly, but fear not, for we have #vintagepledge goodness to perk you up with! 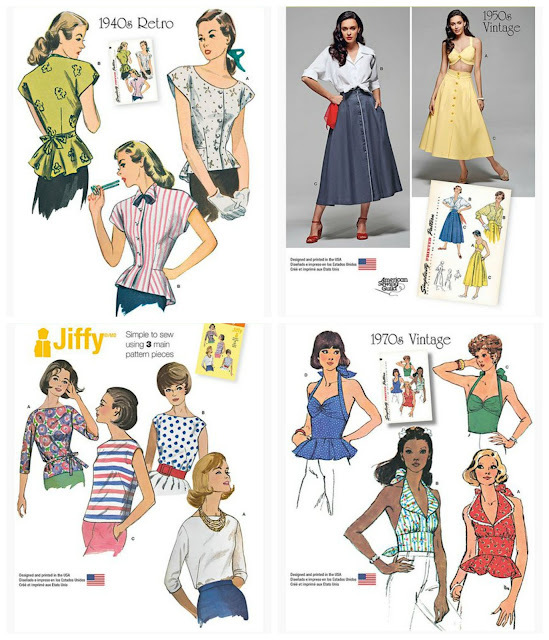 For the second time this year, Simplicity is generously sponsoring the Vintage Sewing Pattern Pledge! This month, they're offering a 25% discount on their vintage pattern range - just use VINTAGE25 at the checkout! Above is just a taster of what's on offer. Grace is offering a £30 gift voucher for her shop, Beyond Measure, which is a true feast for the eyes for those who love to make! 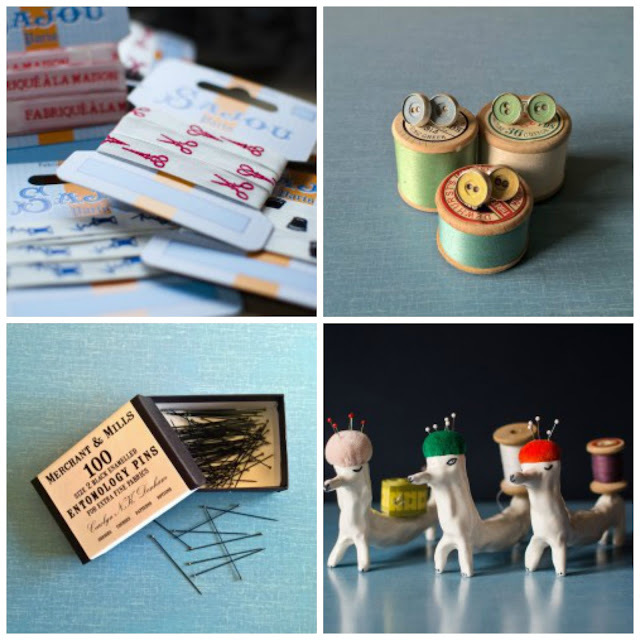 You could spend your voucher on quality sewing tools, eccentric sewing accessories, sewing-themed jewellery...all sorts of wonderful goodies. The voucher is open to readers worldwide, so to be in with a chance of winning just leave your email address below with a comment telling me what you'd choose. Make sure you enter by midnight GMT on Monday 28 September! You can also get 10% off your first order throughout September by signing up to the Beyond Measure newsletter. I would choose Ernest Wright 4″ Swiss Embroidery Scissors which is in my wishlist for some time. Oh those entomology pins look fantastic! Is this giveaway open internationally? Oh my gosh - this is surely the best online haby shop in the world!! I would choose the ceramic standing dog pincushion & thank you for the link to the shop, awesomeness! Glad you like my shop Rie! How cute are these earrings: Vintage Fabric Button Earrings! I need a new pair of embroidery scissors too - but I covet much more besides! I love the porcelain buttons! I love the wooden brooches and ceramic earrings. I really could do with some new pins, I have been reading good things about the entomology pins from Merchant and Mills but the price always puts me off. Thank you. new scissors would be great. Me? I would treat myself to some vintage button earrings. That would make everyone in my office smile, including me. I have made a jacket this month but not sure if I got it on the board or not, I am rubbish at uploading them and end up with them on my board not the vintage pledge one! I would choose some of those beautiful olive wood buttons! I would stock up on the adorable ribbons. I especially love the measuring tape ones. Without doubt - it's got to be one of the ceramic dog pincushions, they're adorable! Thanks for the link! Woop! Looking forward to reading all this :) Love those crazy doggy pincushions too! Thank you for putting this shop on my radar! What fun goodies they have. I love the sewing egg with space for needles and spools for thread. That would be perfect for embroidery on the go. Wonderful giveaway! I'd probably go nuts with the buttons, there are so many beautiful ones! What a generous giveaway. I would be spoilt for choice, but probably opt for the tiny scissors and a wooden tape measure. Thanks. AnnieS. I love the wooden scissors broach. It would look fab on my new autumn jackets. ( I'm sure you can get my email address through this comment - sorry not keen on leaving it public!) thx for giveaway opportunity. All fabulous thank you for the giveaway. As a blousaholic I would choose lovely buttons. I love Sajou haberdashery. Probably some pins so I could drool over the packaging. Ditto for Merchant and Mills range too. I adore Giant Popper Ring and Ear Studs, Merchant & Mills Spanish Lace Pins and Merchant and Mills French Safety Pins!!! I love the leather notebooks! I would choose the entomology pins. Thanks. Oh I would make myself happy with some Sajou glass Head pins and the wooden tape measure. Such a lovely giveaway! Ooh..scissors, m&m pins, the amazing wood pin cushion...decisions decisions! ! So much lovliness! Ooh! How to choose!? I love my wooden pin cushion egg but a Tweed one would be so perfect for my new sewing room. And the scissors with leather covers are irresistible! I would love the sajou wooden pin cushion and I'm a sucker for their tins too! Already have the sewing egg, so the pincushiion would be lovely, and some vintage buttons! So hard to choose though. islasalisbury@googlemail.com I'd stock up on birthday cards for the year! I would get three scissors cases. I "inherited" as many small scissors from a friend who was starting a new life, and I love them all, and use them all over the house. I am afraid to stash any in a sewing or knitting bag because of the risk of creating holes in bags and projects. My email is cbuddies@comcast.net Thank you! The wooden tape measure and the pin cushions!